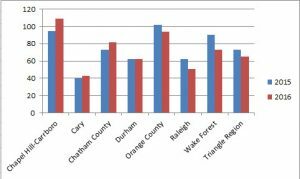 The Triangle is a large area made up of a number of Counties towns and cities: Raleigh, Durham, Chapel Hill, Carrboro, Cary, Apex, Morrisville, Hillsborough, Pittsboro and Orange, Durham, Chatham and Wake counties. Each area has its own unique style and of course housing metrics. The map below is clickable. If you click on an area, you can download the most recent market report for that area. These data are also summarized below. 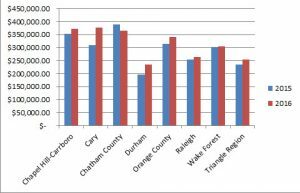 CLICK HERE For a report summarizing the entire Raleigh-Durham-Chapel Hill Real Estate Market Statistics. Over the last year, the metrics have improved overall. Average prices are up, days on market is down, closed sales are up, the list to sales price ratio (how much sellers are getting of their asking price) is up and inventory is down. There are, of course, differences by area and certainly by price range. 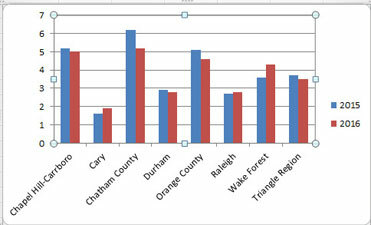 The summary statistics by area are found here. Average prices increased in Cary, Durham, Chatham County, Raleigh and Wake Forest. Days on market are down in Cary, Orange County, Raleigh and Wake Forest. 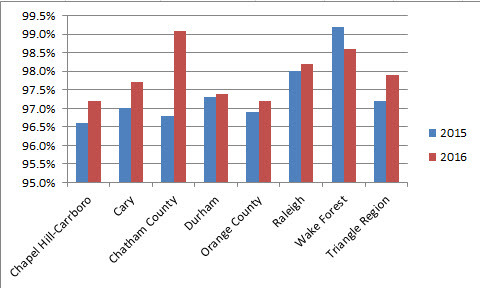 Closed sales and the list-to-sales price ratio are up everywhere (except Wake Forest with a marginal decline). The months of inventory is also down across the board. Note that the dividing line between a buyers and sellers market is 5 months of inventory. These numbers are averages. There is quite a bit of variation by price range and area. DO YOU WANT TO KNOW YOUR NUMBERS? CONTACT US.